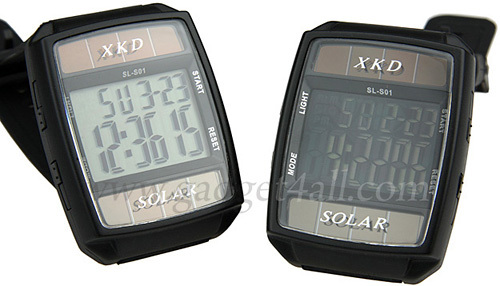 XKD Solar Powered Watch Doesn't Have Looks Going For It | OhGizmo! Citizen has a line of watches known as the Eco-Drive series that are constantly recharged by light which means you never have to wind them or replace the battery. The XKD Solar Powered Watch pictured here does pretty much the same thing, except that while the Eco-Drive watches manage to cleverly hide the solar cell as part of the watch face, the XKD looks like someone has salvaged the cells from an old solar powered calculator and simply slapped them onto a basic digital watch. So if you’re sick and tired of having to replace the battery on your watch every 7 or 8 years, and don’t care what it looks like, then you’ll be happy to hear that the XKD model can be picked up from Gadget4all.com for just $17. The first digital watches were pretty ugly too (and these look like them) but got better over time. Hopefully these gadgets will get smaller and allow more design to be incorporated. These look too big for many women’s wrists sizes. Check out Casio’s G-shock line they have some solar watches as well. I have the GW-1200A and I love it.